WE BUILT A TABLE!! AND BENCHES!! And we’d never done this before but it kinda turned out awesome so I thought I’d share as much as I could in case you might want to try something like this yourself!! So we built them out of standard lumber from Home Depot, a couple of non-fancy tools, and plans we drew up ourselves. It took us about a week of building it on-and-off in our spare time. It’s level, strong, and sturdy!! Plus it’s disassemble-able (is that a word??) so we can dismantle it if we need to move it. Please bear in mind that we’ve never built anything like this before. 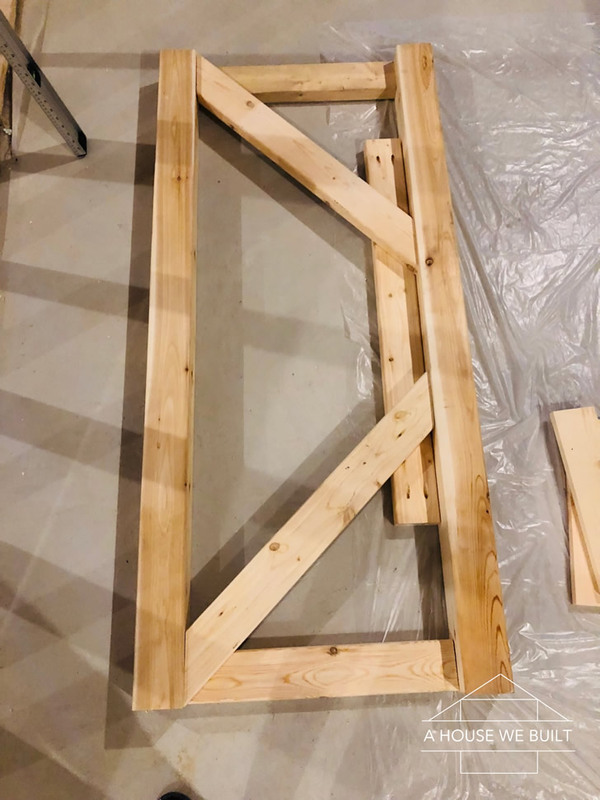 We’re total amateurs who just really took our time to come up with the best possible design we could with the limited tools we had, so if you’re a master carpenter or something, please don’t judge it too hardly. Our table is imperfect but we absolutely LOVE IT and fully embrace its imperfections as part of its charm. Because we’re not professional furniture builders, we basically had 2 directions we could take this build: either try to somehow make it absolutely perfect (which was just unreasonable for us given our limited skills and tools) or just embrace any imperfections and do the absolutely best we could — and this was the direction we went. We like to call it RUSTIC!! 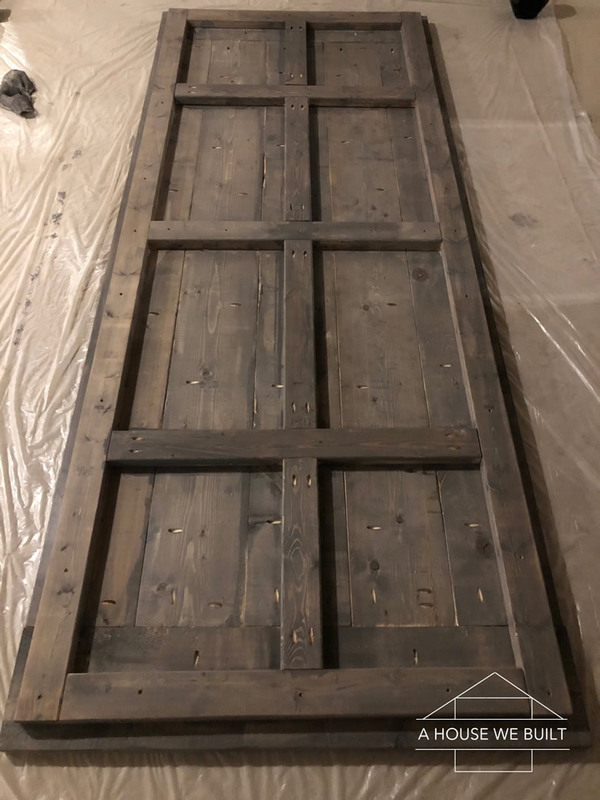 It’s funny but while we were building, anytime something wasn’t totally perfect and we’d be considering if we were okay with it, we’d mostly just look at each other and shrug and be like “It’s rustic!!! !” and go with it. I mean, we did redo a few things along the way (there’s an entire 4×4 chopped into itty bitty bits in our garage where we failed a bunch of times while learning to do 45 degree cuts on an old saw but hey — we got it in the end! 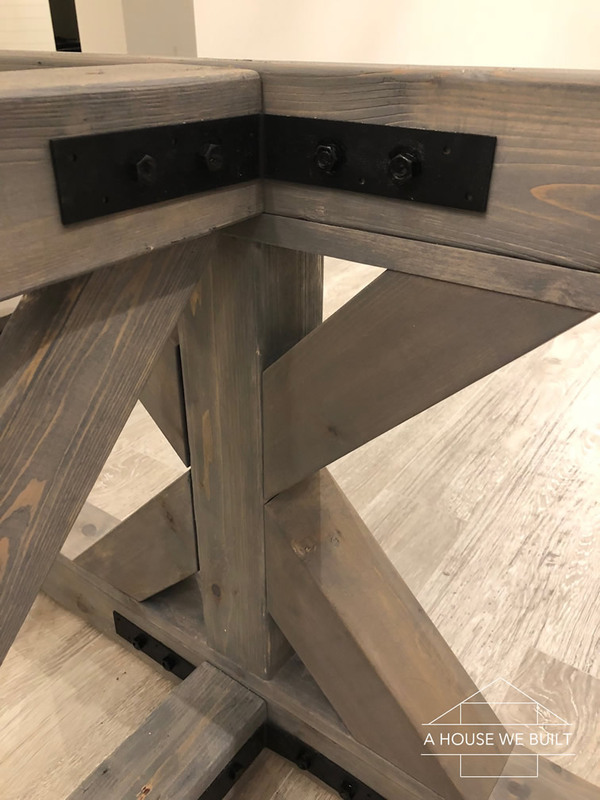 Sure, some of the bolts don’t perrrrrrfectly line up, and some of the joins could be a little straighter BUT like I said it is 100% level, and is strong and sturdy beyond all reason!! And most importantly, we have the memory of building it together and the satisfaction of building something that we’ll use everyday, and we learned a lot! 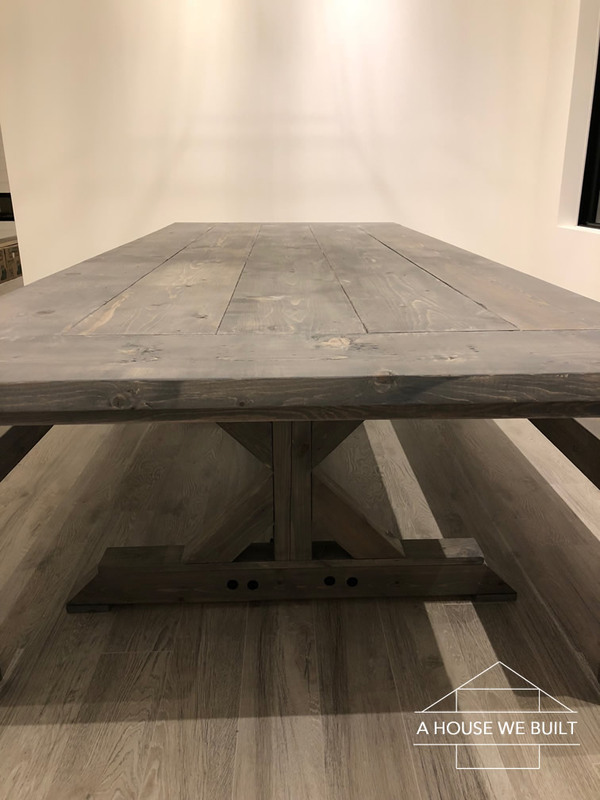 The original reason we chose to build this table rather than buy one was that that size we wanted was really hard to find anywhere at a reasonable price. The closest we found to what we wanted was at Restoration Hardware, but it wasn’t “exactly” what we wanted and we also didn’t feel like spending ten thousand dollars on a table set and I’ve wanted to try our hand at building one ourselves forever so we ended up finding a few different tables we liked the look of from different places and then we spent a couple hours figuring out a plan for how to build it, as well as how to reinforce it from underneath — actually this was super important because the biggest thing we heard about building out of regular lumber is that it can warp and crack over time so we really took a lot of precautions to try and avoid that. All in all I’m going to guess that our total build cost (lumber & tools) was somewhere under $500. 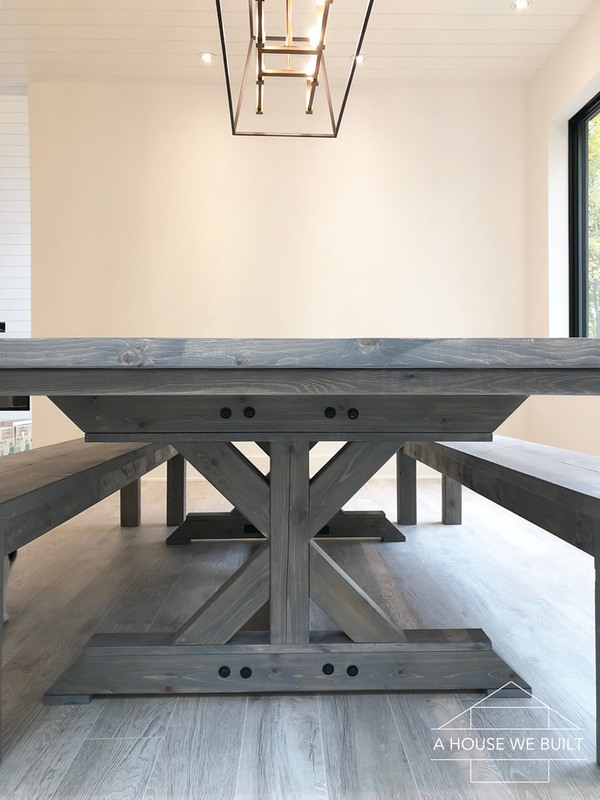 About the dimensions — we’re a family of tall people so we built this table and bench set a bit higher than normal heights. If you want them to be lower, just shorten the respective leg pieces accordingly. you have to find the straightest boards possible. We spent over 2 hours in the store sifting through ALL their lumber. The boards need to be straight and not warped and have no cracks if possible. 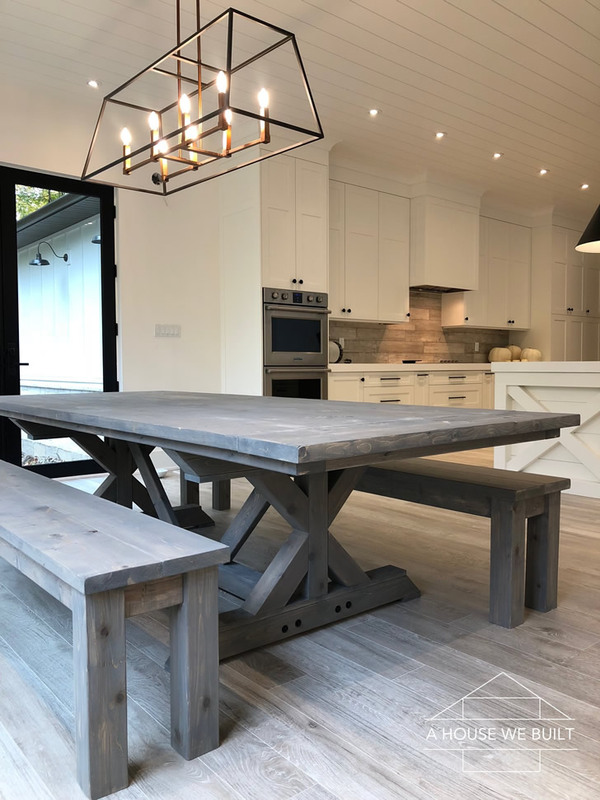 Once you’ve found all your pieces, lay all the “top boards” (table top and bench top) on the floor together BEFORE you buy them and make sure that they fit together well. 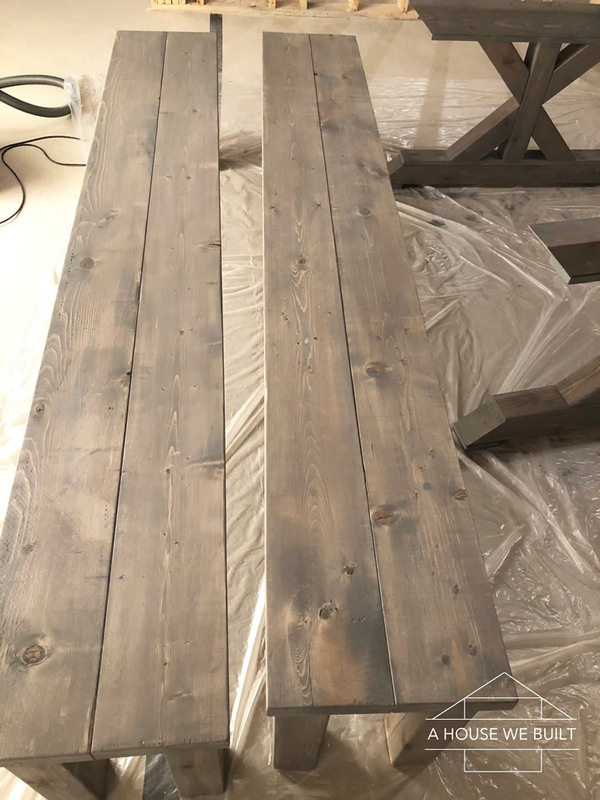 Sometimes two straight-ish boards won’t line up together well so you HAVE to make sure they do otherwise your table/benches will be crooked. 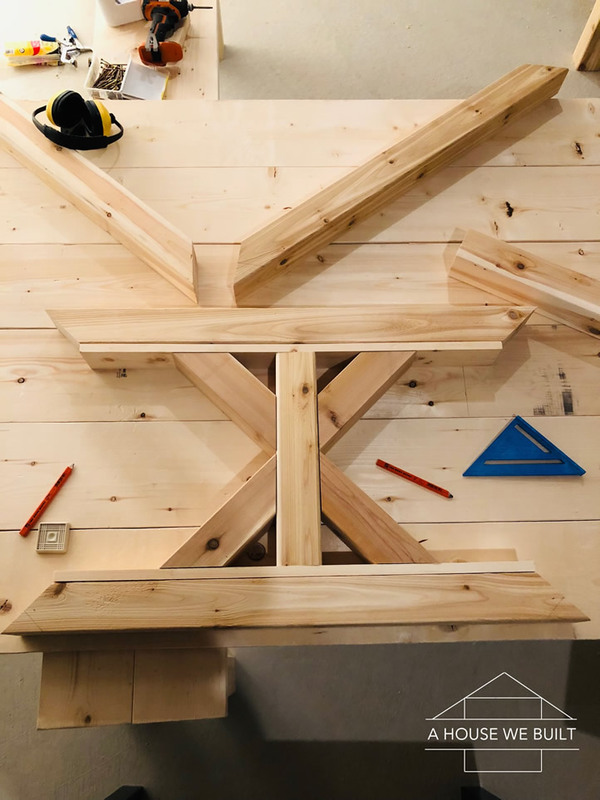 This is the ONLY way you can use standard lumber so you absolutely cannot just the first pieces on the shelf. 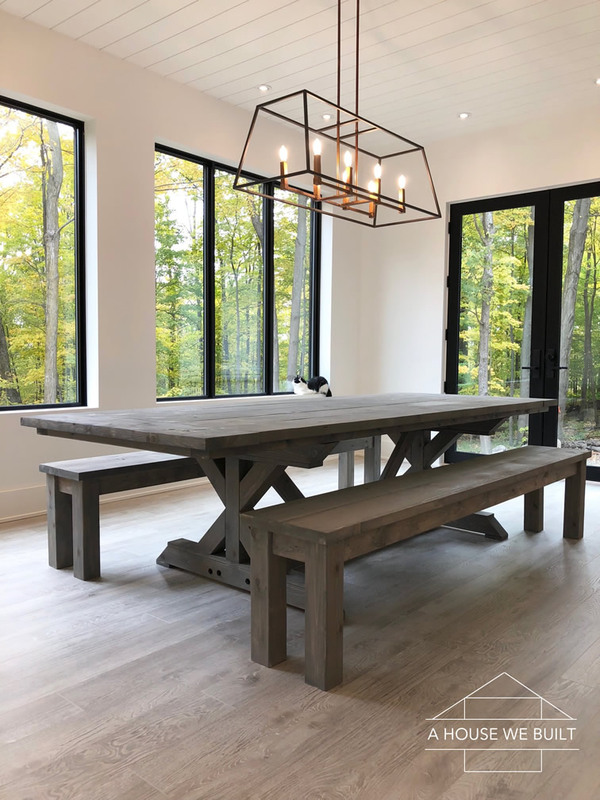 There’s a surprising amount of variety in table designs – not something we ever considered until we sat down to make one. How high should it be? How about the chairs? What’s the best width and length? The first thing we did was find an adjustable office chair and fiddle with the height until we found a good middle ground that worked for both of us. 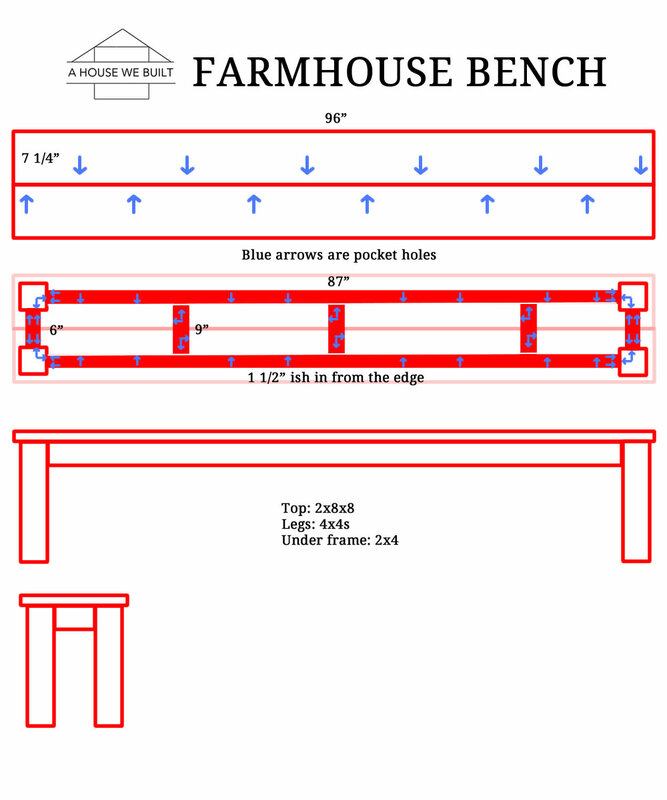 This became the height measurement for our benches. Once we had that, we used a flat piece of wood to simulate a tabletop and figured out the perfect tabletop height for us. This will vary from person to person! With our key measurements decided, we drew out our plans. This REALLY helps make sure you haven’t forgotten anything and keep track of big each piece should be. 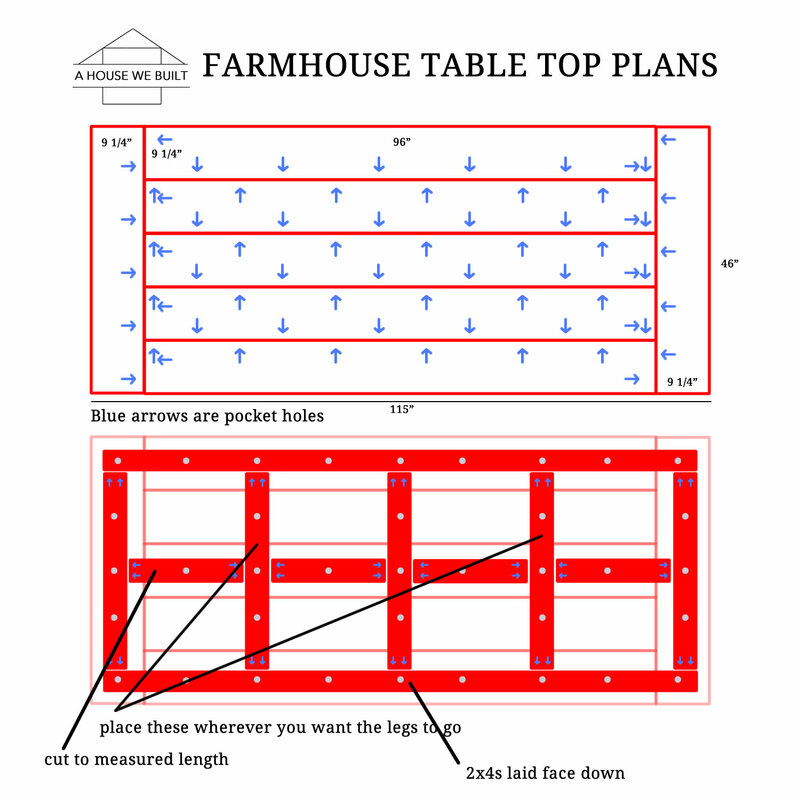 We also drew the table from the top-down AND the side – this is incredibly helpful as a reference while buying materials and assembling. We’ll share the plans we came up with below. We figured that the benches were like simple, miniature tables, so we decided to start with them as a way to get our process figured out. It was also VERY nice to be able to use the benches as work surfaces during the rest of the process! We started with the benchtop: just two 2x8s cut to the same length and joined with Kreg Jig screws and some wood glue between the boards. We did found it easiest to do this on the ground and stood on the boards while we screwed them together to keep everything flat and even. With the benchtop built and laying on the ground, we attached the bench legs next. We put the legs in place and re-measured everything to make sure our cuts and math were correct, then marked the placement of the legs with pencil. The legs were 4×4 cedar, attached with Kreg Jig screws on the two inside faces where they wouldn’t show. We then attached the 2×4 pieces between the legs with Kreg Jig screws into the legs and down into the underside of the benchtop. 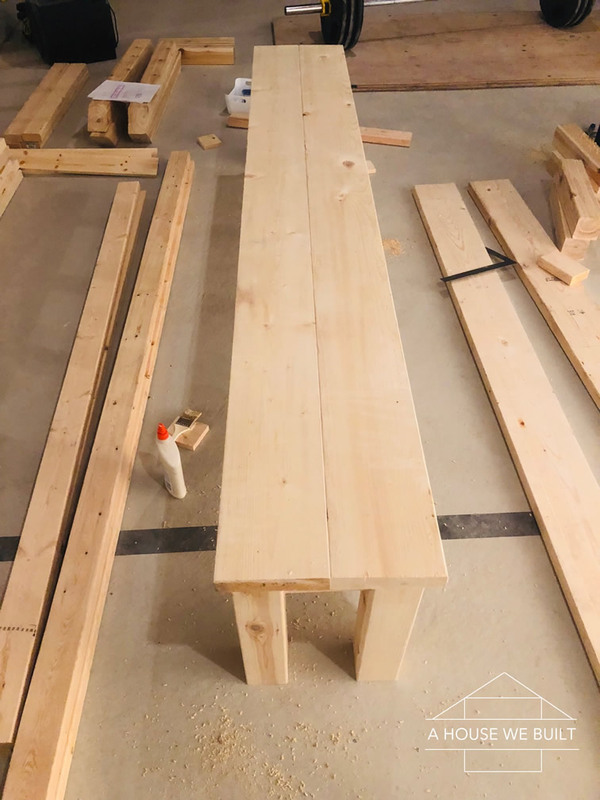 These 2×4 pieces are important for the bench’s strength, as they anchor the legs against each other, as well as to the benchtop. 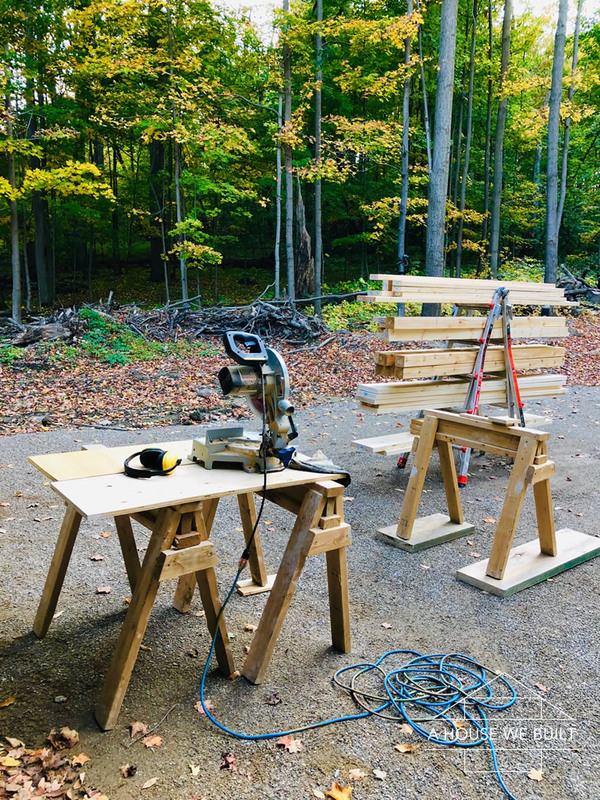 We completed the first bench, and then did the second – we found this was a good way to do things in general, as we’s figure out a good work process the first time and the second one went much faster. Having built the benchtops, we were well-prepared for the table-top. We spent a lot of time laying out the boards in different orders and orientations to find the best look and most even fit. When we had the order figured out, we numbered each board, and marked all the Kreg Jig screw spots, placing the screws so that there was one every six inches, alternating sides. Make sure you do your pocket holes on the UNDERSIDE of the table top! At this point we also placed the breadboards, and trimmed them so that everything fit snugly. With everything fitted and labled, we drilled all of the Kreg Jig holes, then started assembling. We started with the middle board, and then worked outwards, alternating sides. 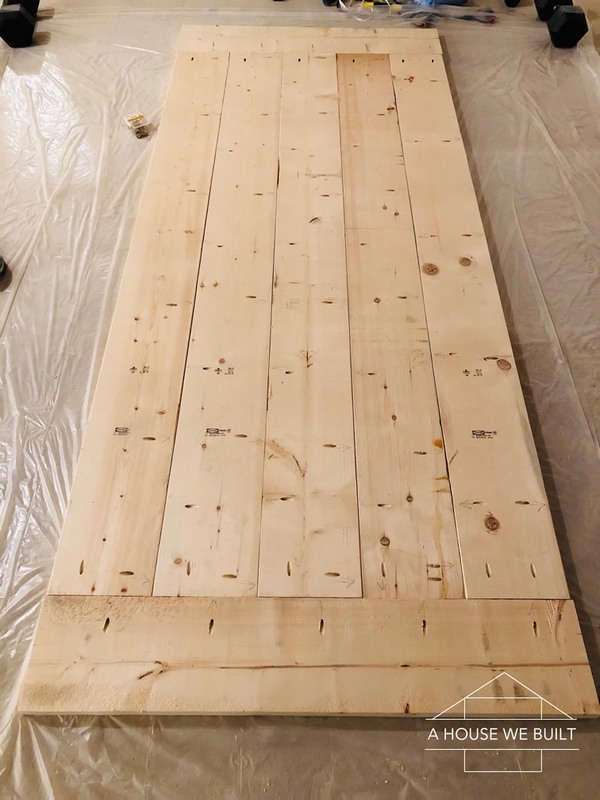 Each board would get a smear of glue, we would stand on the boards to get them straight, and then screwed the board into its neighbor with a few screws in the center of the board. We did the whole tabletop that way, and attached the breadboards last. This way main planks could be fitted to the breadboards much more tightly. The next thing we did was assemble the tabletop’s 2×4 underframe. This was done separately, again on a level floor, and again using glue and Kreg Jig screws. 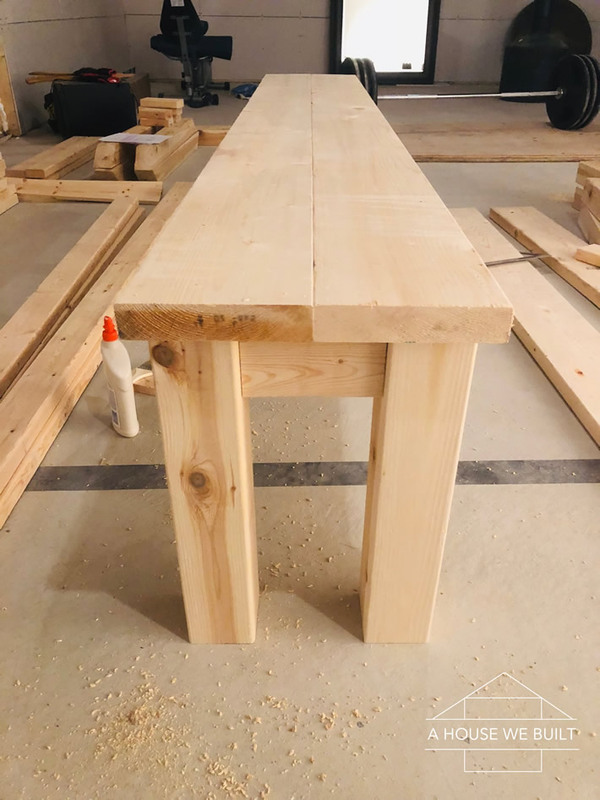 Two long 2x4x10s cut to 111″ pieces formed the sides, designed to support full length of the tabletop from breadboard to breadboard. 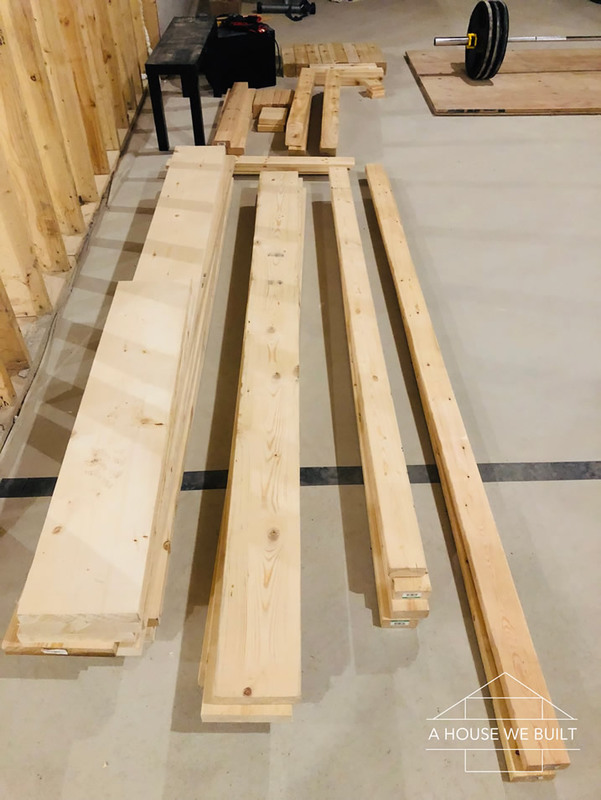 The cross pieces between the 2x4x10s link the tabletop planks together, and two of them are placed exactly where the two base crosspieces will go. The pieces along the centerline give the base centerpiece a place to rest on. We laid everything out beforehand and measured for squareness and levelness, as well as measurement accuracy. Once assembled, we laid the underframe on underside of the main tabletop and screwed it into the underside of the tabletop. 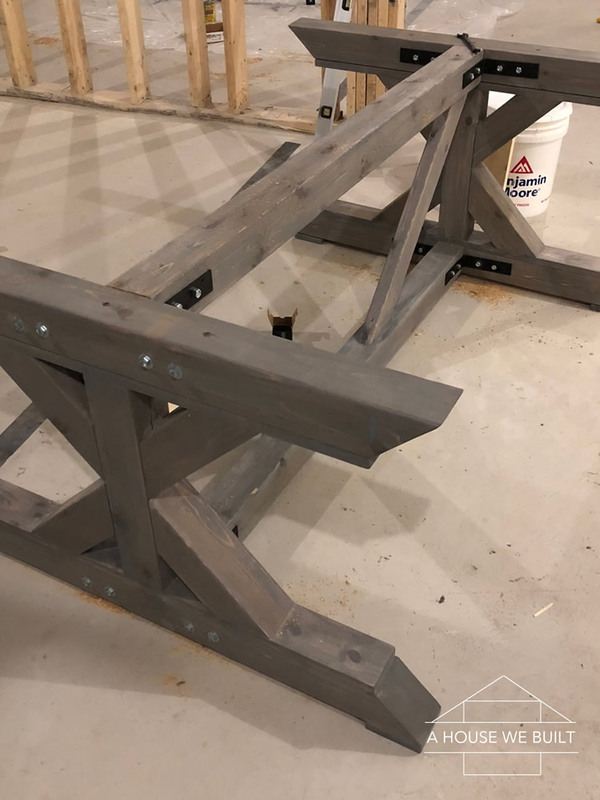 The underframe is super-important as it gives the tabletop a ton of structural strength, gives a secure place to attach the base, and helps hold those long, planks straight and flush. With the floor as a level surface and all the screw holes down beforehand, assembly went pretty quickly. We wiped away excess glue, but left the tabletop on the floor overnight while the glue dried. The base crosspieces were probably the most complicated part of the whole build process. 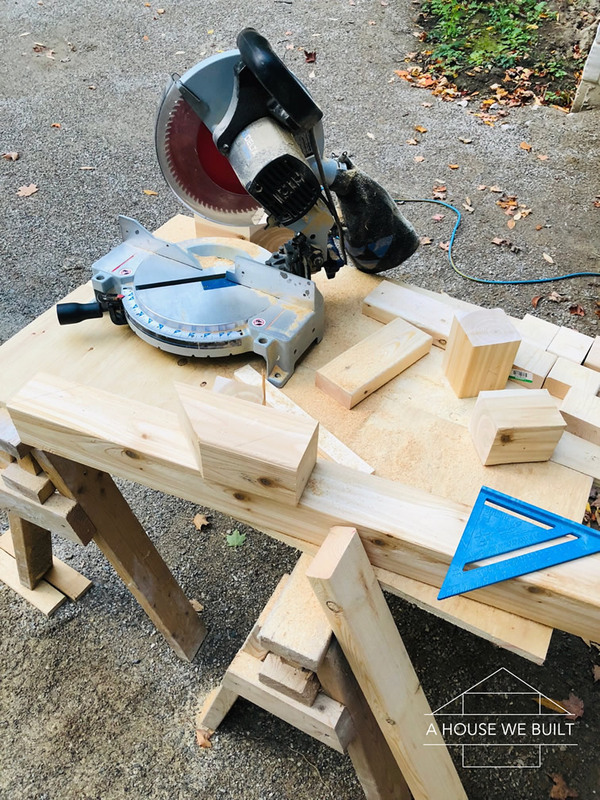 It was difficult to cut the 4x4s at a precise angle with our old saw, and everything needed to fit together quite snugly as these were a very visible part of the table. 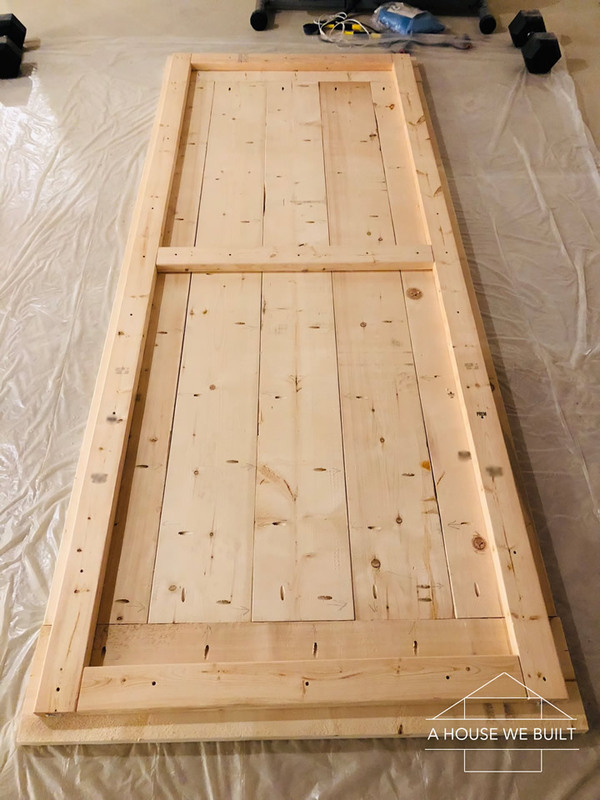 We built the horizontal tops and bottoms of the crosspieces first, gluing and screwing in the pine planks to the cedar posts first, and then attaching the vertical 4×4 posts from the top and bottom using more glue and deeply-sunk 4″ screws. With that done, we fit in the 4 diagonal pieces of 4×4. These were glued and screwed directly into the center post through their face (we later covered the holes with wood filler but that’s optional), and attached them to the top and bottom pieces using glue and more deep-sunk 4″ screws from the tops and bottoms. 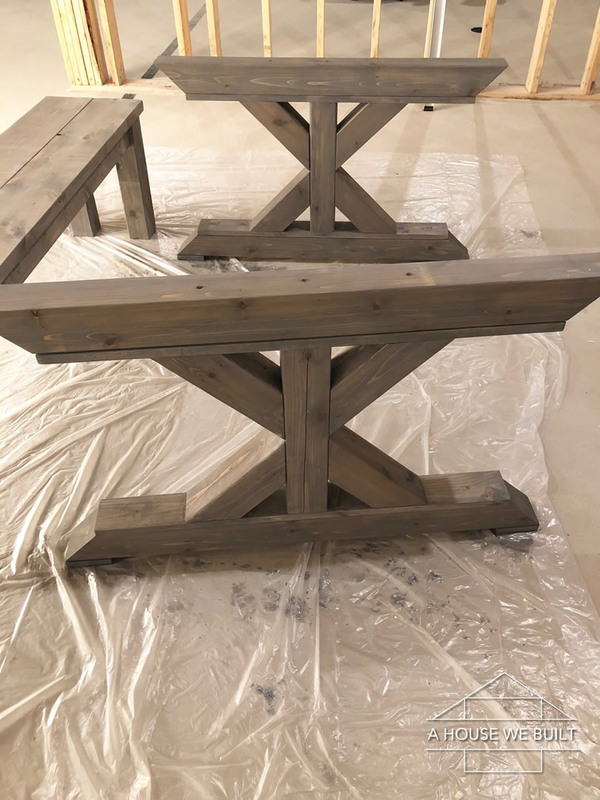 Then just for fun, we put the pieces we had together — just propped up — to see what they’d look like and to verify how far apart we wanted the table legs to be. 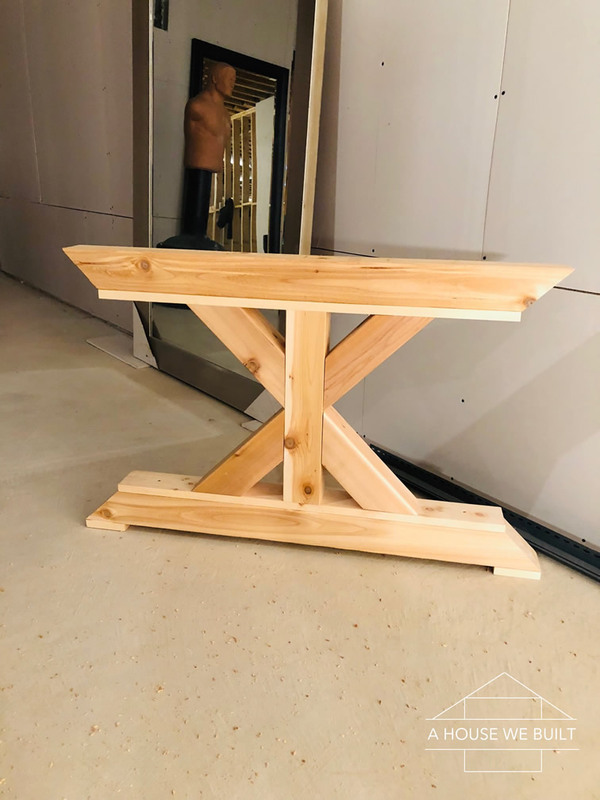 The base centerpiece’s top and bottom members were literally just straight-cut pieces of 4×4 cedar, and angled members were 2x4s cut at 45 degree angles on both ends and they go basically where they fit. We attached them to the center of the 4x4s with screws as shown in the plans. 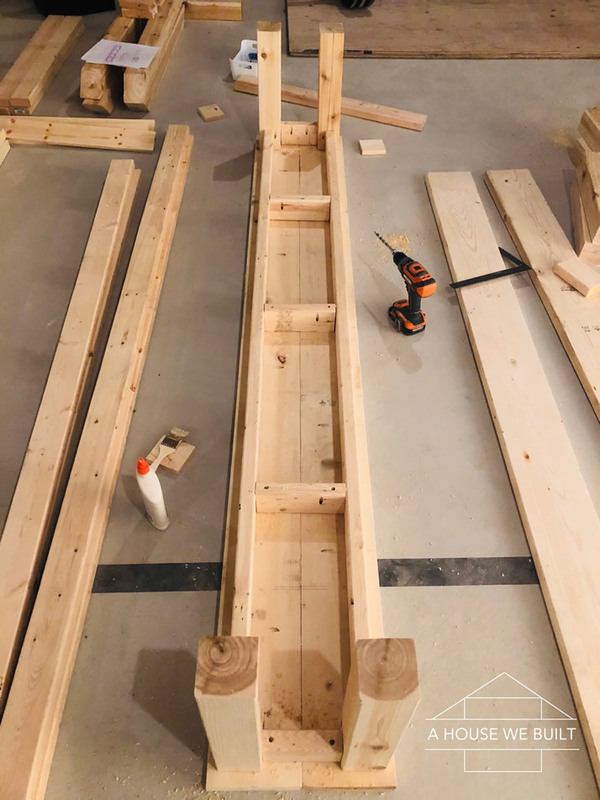 We glued the vertical members in place and then screwed them first from the face down/up into the 4x4s, and then from the top and bottom through the 4x4s using deep-sunk 4″ screws. 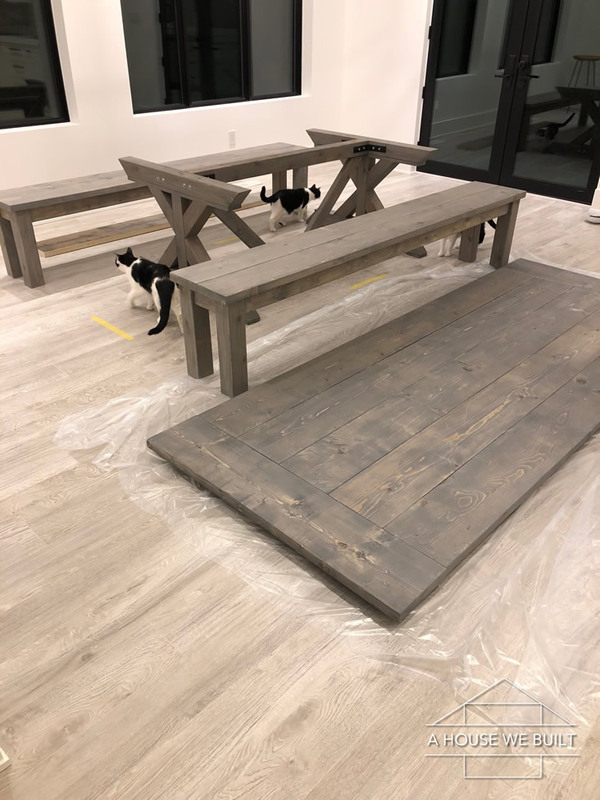 You’ll notice these pictures don’t quite line up with the timeline of the “Stages” and that’s because we got a head-start on sanding and staining after building the benches, table top, and legs, but before the centerpiece. We then stained the centerpiece right after we built it. But basically, to begin we sanded absolutely everything down with 150 grit sandpaper. 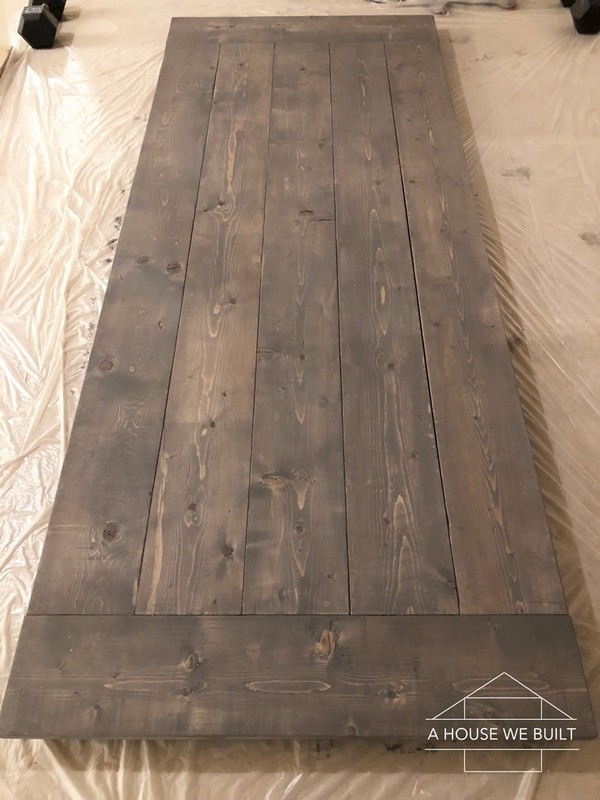 We used an old electric sander for just a few places where there was writing stamped into the wood so that was just an easier way to get it off but not necessary — you could totally do that by hand too. We then conditioned it with this pre-stain conditioner (Amazon) and allowed it to dry for about 2 hours. then using old (but clean) rags, we stained it with Classic Gray (Amazon) and let the stain sit for about 10 mins before wiping off all the excess, then allowing everything to dry overnight. Tip: use an old paintbrush to get the stain into hard-to-reach corners. Finally, we’ll be top coating it with something totally matte because we don’t want any sheen at all. 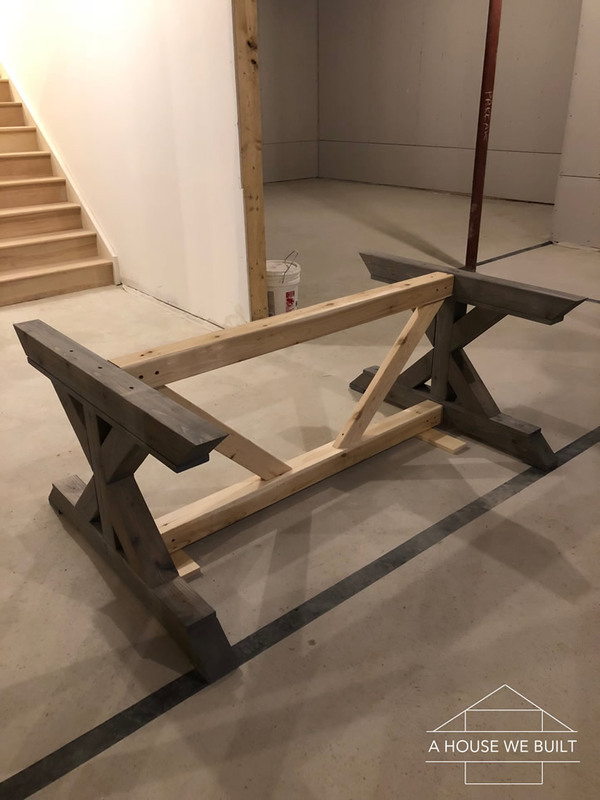 We decided to use bolts and structural steel brackets for connecting the crosspieces to the centerpiece, since this is a pretty heavy table and the “side-to-side” wiggle is the one weak point in the structure. Just screwing probably wouldn’t be enough in the long run, since screws don’t do well with wiggle strain. We first painted the bolts and brackets with spray-on matte black metal paint (optional because if you like the metal look then this is not necessary). Once those dried, we placed the brackets on the base centerpiece first, and marked the holes on both sides. We drilled the holes through, making sure that the holes came out at the right place on both sides of the 4x4s, and then bolted them on. With metal bracket on both sides, we only ended up using washers on the outside sides. 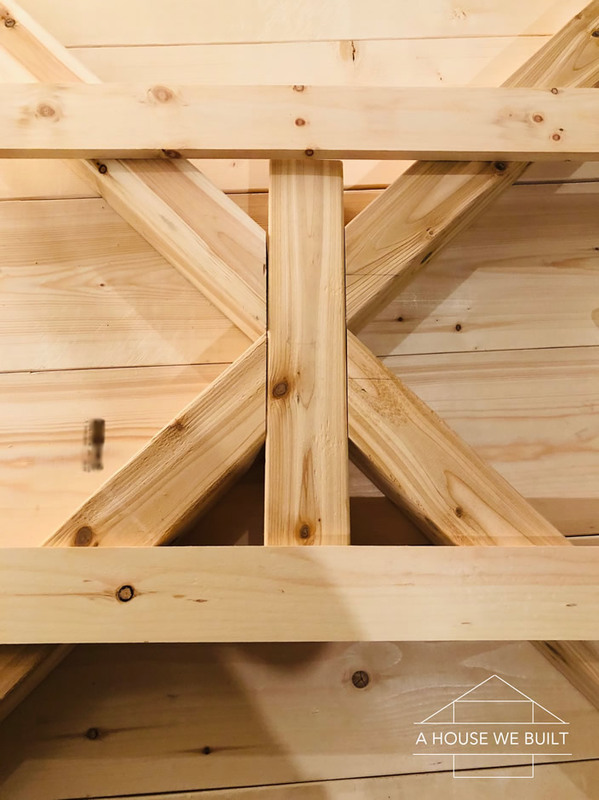 With the centerpiece’s brackets attached, we then stood up the crosspieces and centerpiece, made sure everything was square, level, and snug, then marked where the bracket holes fell on the crosspieces’ horizontal members. We then took everything down and drilled the holes we’d marked in the crosspieces. With the base assembled, we lifted the tabletop up and placed it atop the base. 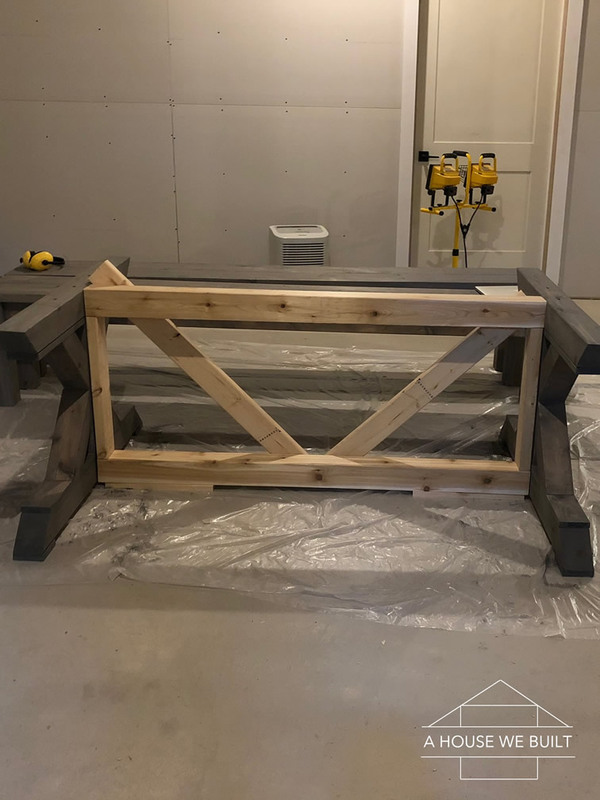 Our measurements turned out to be pretty accurate, and the tabletop’s 2×4 underframe lined up almost exactly with the base’s centerpiece and crosspieces. 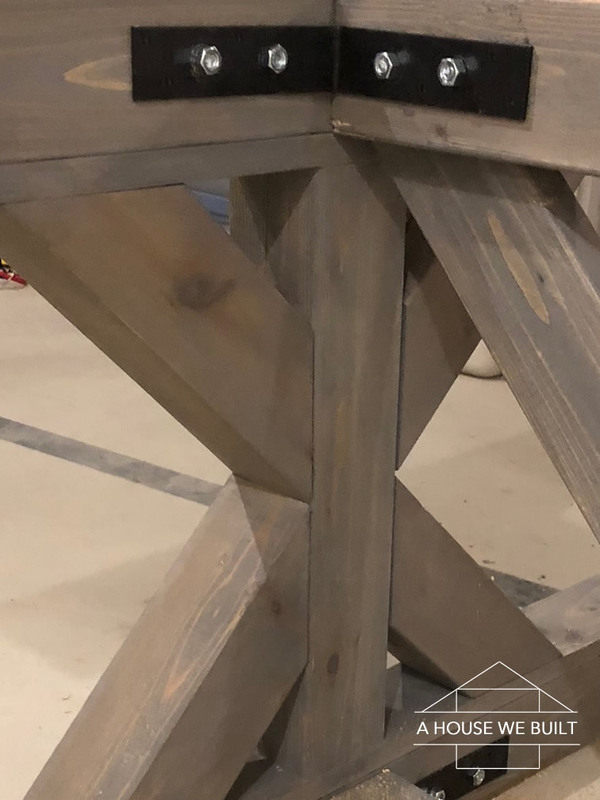 We secured the tabletop from below with 5 deep-sunk 4″ screws up through the base’s horizontal members: one in center of the centerpiece and one on either side of each cross-piece’s centerpost. We used some electrical tape to mark the right depth on bit we used for driving the screws, ensuring that the screw went all the way into the 2×4 frame. And that’s pretty much it!!! DISCLAIMER: Please be careful! Power tools, screws, saws, and improperly-built furniture can all be dangerous. Be careful, and consult with an expert when appropriate. All content provided here is for entertainment purposes only and is not expert advice. We make no claims as to the accuracy or completeness of any information here. We shall not liable for any errors or omissions in this information, nor for any losses, injuries, or damages from the use of this information. Anyone who uses these instructions or the resulting items does so at their own risk. And again — if you’re a master carpenter, please don’t judge this harshly. 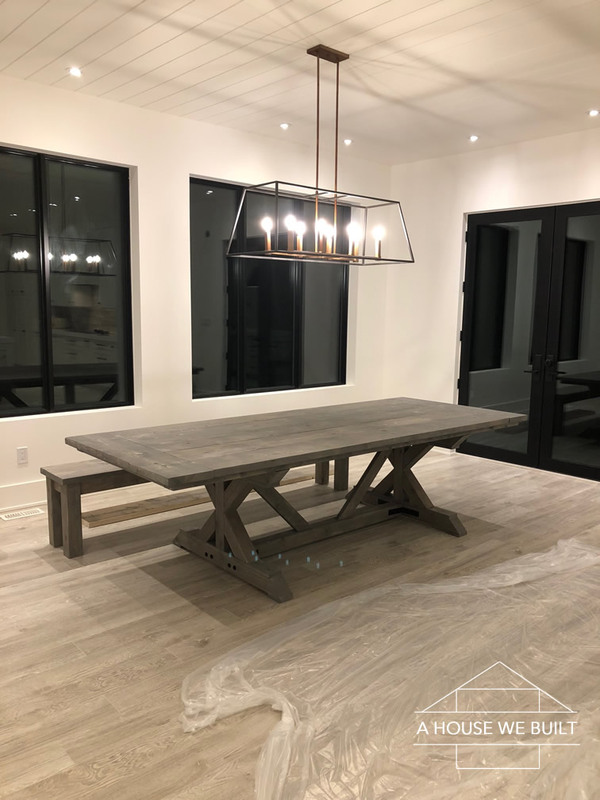 I’m sure there are a lot of better ways to build a table, but this way is sturdy and level and we were able to build it without buying any crazy tools and without any special skills so we’re very happy with it! Or if you’ve come to the end of this post and are kinda thinking that this is wayyyy too much effort, here are some very similar tables you can buy online: Wayfair | Wayfair | Wayfair | Pottery Barn | Pottery Barn | Hayneedle | Overstock | Overstock | McGee & Co. If you have any more questions, leave me a COMMENT down below! 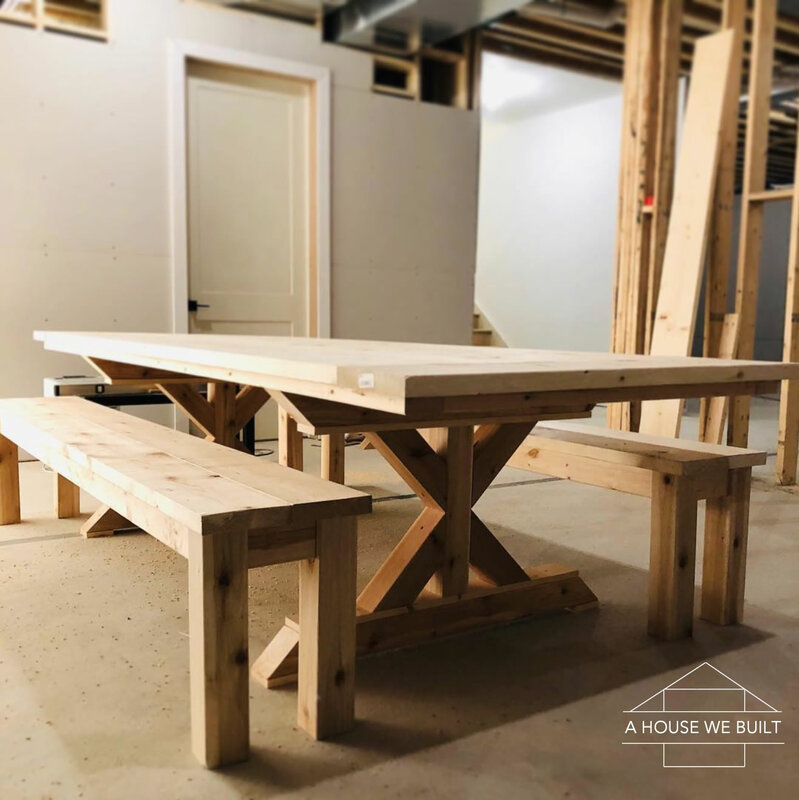 And if you decide to build this table set, please tag us on Instagram (@ahousewebuilt) so we can see!! You’re house is so beautiful! I love this table, so unique! 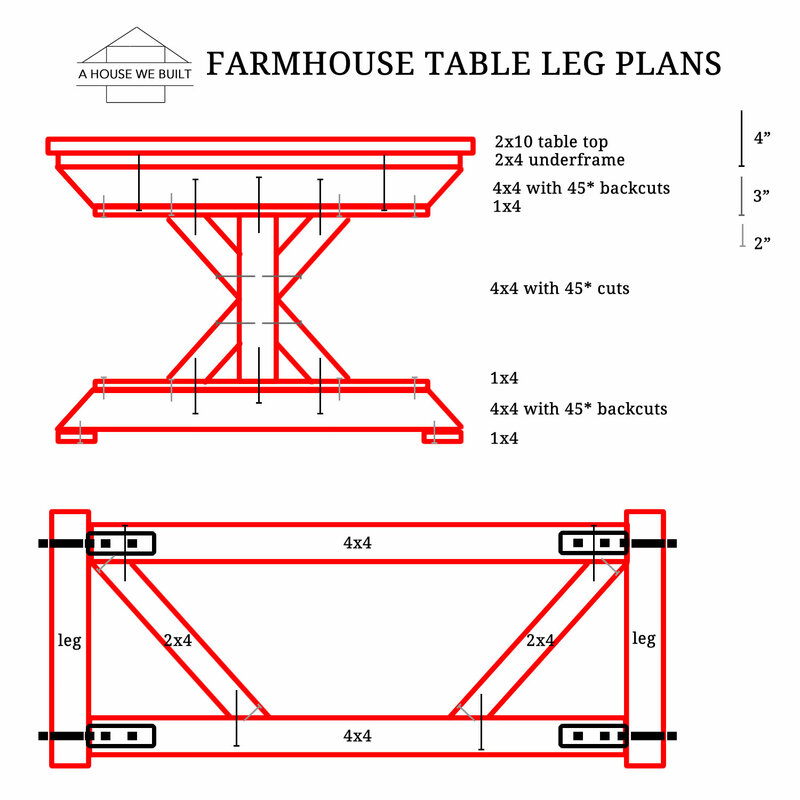 What would you say the estimated cost is to build this table? Including all power tools needed, lumber, paint/stains, etc. Commenting again because I referred back to the post and saw the answer to my question. no need to reply, again just love the table. Gorgeous!! Is there anything on the feet of the benches to prevent scratching the floor? Thank you 🙂 No but they are very well sanded (I did it myself) and we have laminate floors so they don’t really scratch. I do plan to add felt feet but haven’t gotten to it yet. Does the top have tiny grooves in it or were you able to get the boards close enough to each other that food crumbs won’t get caught in them? A little, you could rip down the boards but we didn’t want to. The table is very easy to clean though.